Austrian Institute of Technology, Wien, Austria – The research team were developing a novel micro-fluidic device for the fast detection of human pathogenic bacteria. This is crucial for early therapeutic intervention, which is important for a successful treatment of infectious disease. With their developed continuous-flow polymerase chain reaction (PCR) micro-system, processing times of 30 minutes and throughputs of up to 80 samples per hour were possible, which significantly reduces standard diagnostic times of 3 hours or longer. Long DNA fragments of up to 1.3 kbp could be amplified successfully in a micro-fluidic setting and bacterial amounts as low as 100 cells could be detected, which are further benefits of the micro-device. Therefore, their unique design targeted major improvements in fragment length, test speed, sample throughput and miniaturisation. The reactor consists of Teflon tubing coiled around a triangular prism with 3 different temperature zones (95 °C, 55 °C and 72 °C). PCR requires very stable temperature control as a key ingredient to the success or failure of this process. In addition a reliable system with high usability was required. Following some technical support, Electron Dynamics supplied pre-configured temperature controller for this process. The research proceeded with success and its research paper being recently published. The paper describes how “For an efficient PCR, accurate and precise temperature is crucial”. Researcher Johannes Peham said “The success of our research was aided by the temperature stability achieved with the equipment from Electron Dynamics with high temporal stabilities possible down to 1 mK”. 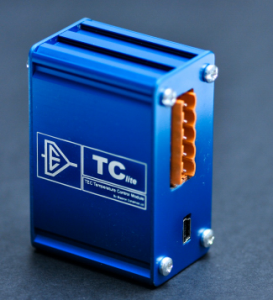 Electron dynamics was able to deliver this from its TCM temperature controller range. MD Andy Hinks said ” It is always very satisfying to meet a requirement successfully and to have it in an easy and supported format, so that the focus remains on the research rather than on the technology used to produce it. Our new series of Temperature Controllers are designed for use with TECs or Peltier Devices and resistive heating elements. Peltier devices offer precise temperature control by being able to cool or heat, which can provide stable temperatures with varying ambient conditions at up to 0.05ºC stability. For other applications e.g. cryo-control, heating and other, control is possible in the range of –200 to 350 deg C.Typical uses for the controller would be with laser diodes, infrared detection, high gain amplifiers, cold plate assemblies, device measurement and process control. It is also suitable for controlling single and multiple TEC arrays. It has a pulse width modulated output, which provides a continuously variable output for cooling and heating as required.Typical uses for the temperature controller would be with laser diodes, infrared detection, high gain amplifiers, cold plate assemblies, device measurement and process control. It is also suitable for controlling single and multiple TEC arrays. The pulse width modulated output provides a continuously variable output for cooling and heating as required. The TC Lite is now available in our online store.